There could be many reasons why you're drawn to this book -- or perhaps synchronicity had a part to play in that this book somehow found you! Are you looking for answers as to what happens to your loved ones after they've passed? Perhaps you're wondering what you should do after having had your own psychic experience. 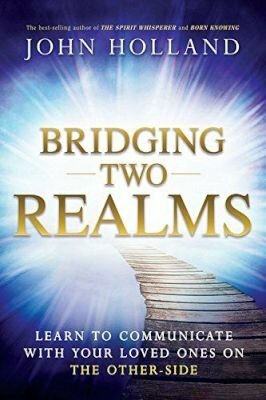 Whether you're a student of psychic studies or a practicing medium, a believer or a skeptic, or someone who is bereaved as a result of a loss, this book was written to provide you with all the answers to your questions about the Other-Side.In Bridging Two Realms, renowned psychic medium John Holland offers one of the clearest pictures anyone could have of the Spirit World. He draws on his decades of personal experiences with Spirit, and includes inspirational stories and real-life case studies, to help you pursue the unfoldment of your own spiritual abilities safely and wisely. His hope is to help the bereaved by giving them comfort and inspiration in knowing that there really is life after physical death. There is evidence of the Spirit World and what happens in those spiritual realms. Your loved ones are just a thought away, and you can still communicate with them. They're still close, and they often try to reach out to us to lend their love and support.Ultimately, you will learn that mediumship is not just about connecting to the Spirit World; it's just as much about helping and healing the living. There are spiritual bridges that can be built to connect to your loved ones who have passed, as well as the most important bridge of all: the bridge to your own spirit.